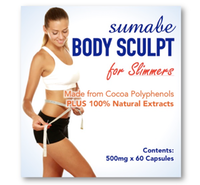 Sumabe® Body Sculpt for Slimmers is derived from Cocoa Poly-phenols to enhance a refined body shape and form. Cocoa and chocolate are the richest dietary sources of polyphenols and in particular, the two procyanidins, catechin and epicatechin. The structure of procyanadins makes them extremely powerful antioxidants. Research shows they have a greater potency than antioxidant vitamins C and E.
Cocoa polyphenols have a protective effect on endo-thelial function and contain pro-cyanidinsepicatechin and catechin - which are exceptionally effective antioxidants.